Lingual means the backside of your teeth. Therefore, Lingual braces are fixed and hidden behind your teeth and aren’t visible to others. These braces are customized according the shape of your teeth to perfectly conform to the same. 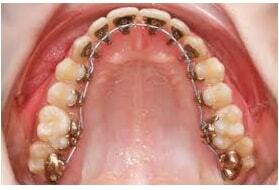 The customization ensures that the braces are comfortable and do not annoy your tongue or surrounding areas. The brackets are made of gold therefore this treatment is suitable for people who are allergic to nickel. Step-By-Step Process for Having Incognito™ Hidden Braces? 1. A consultation session is advised before you decide to undergo this treatment. At Dr Kandhari Skin and Dental Clinic, our specialist orthodontist will need to conduct a thorough examination of your teeth. 2. The second appointment will be scheduled to take photographs, X-ray and impression of your teeth. 3. The X-ray, impressions and photographs are sent to lab where they create a model of your teeth and another model which showcases how your teeth will look post this treatment. 4. If the dentist and patient are satisfied with the models, then customized brackets will be created. 5. Finally, the customized brackets will be fixd with the help of wires and elastics.